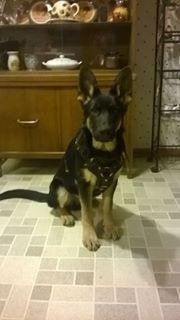 This is my German Shepherd pup Jago he is 6 months old and was born from our male Blitz and our female Solome. We do schutzhund training with our dogs and we plan to compete soon! Jago has already started doing bite work (protection training) as well as obedience. We will be starting tracking soon with this little guy! Jago is a joy however a bit on the aloof side. Jago seems to have a special love for young children and also enjoys our cats somehow.